Receivables financing in the UK has taken a step forward as The Business Contract Terms (Assignment of Receivables) Regulations 2018 No. 1254 has come into effect in the UK, I previously wrote about the proposed legislatory change back in the summer. It will apply to qualifying contracts entered into on or after the 31st December 2018. 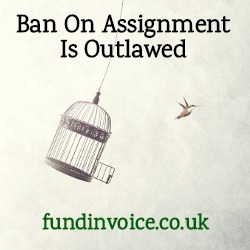 The new legislation makes null the effect of "ban on assignment" (BOA) clauses, which were previously included in contracts by some large organisations to prevent their suppliers from using forms of receivables financing, such as invoice finance, invoice discounting and factoring (we can't give legal advice so you need to seek independent legal advice before acting on this). The legislation sets out the definition of a receivable as the right to be paid, under a contract, for the supply or goods, services or intangible assets. "Subject to regulations 3 and 4, a term in a contract has no effect to the extent that it prohibits or imposes a condition, or other restriction, on the assignment of a receivable arising under that contract or any other contract between the same parties.". With regard to the exceptions mentioned in that clause, regulation 3 sets out an exception if the receivable is owed to large enterprises or special purpose vehicles. Regulation 4 sets out certain types of contract that are exempt e.g. where neither party entered into the contract in the course of carrying on business in the UK. The hope is that this will make access to invoice finance easier for many UK SMEs, and it will avoid risky workarounds that have been used by receivables financiers to cope with BOA clauses. I am not sure quite how much of an additional impact this will now make, considering the Court Of Appeal ruling that previously upheld the right to assign book debts, however it does formerly remove one of the barriers to accessing this type of cash flow funding.